ORLANDO – With all the buzz about citrus greening last year, Jim Gonka thought this year’s annual citrus gleaning might be the worst ever. Instead, it was the best. Volunteers at First UMC, Oviedo, unload boxes and pruning supplies from a Second Harvest Food Bank truck that later transported bounty from the Society of St. Andrew Backyard Citrus Drive. Photos by Don Youngs. Diseases that laid waste to so many citrus trees in past months didn't seem to make a difference, as 120 volunteers who met at Zellwood UMC filled a tractor-trailer with more than 20,000 pounds of surplus oranges from groves and backyards in their community. Volunteer pickers also plucked grapefruits, tangerines, tangelos and even kumquats to add to the bounty headed for Second Harvest Food Bank and, from there, to a host of agencies feeding thousands of needy families. "Talk about God's works," said Gonka, who is secretary of Zellwood’s United Methodist Men's Club and one of many volunteer organizers for the 2014 Florida Backyard Citrus Drive. Zellwood was one of five churches from Central Florida that joined the Jan. 11 citrus drive, sponsored annually by the Society of St. Andrew. From morning until lunchtime, a total of about 400 volunteers gave up a few hours on a Saturday for a good cause. The result? 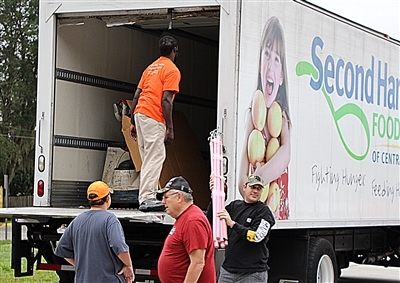 About 35,000 pounds of citrus went into trucks provided by St. Andrew’s partner, Second Harvest. The Zellwood congregation is small, and many of the approximately 110 members are age 60 or older. Scout packs and troops, young people with AmeriCorps and members of St. Luke's UMC, Windermere, helped round out the volunteer force. "There is definitely satisfaction," Gonka said. "You look at trees full of citrus and then a truck filled with fruit and know 50,000 to 60,000 people will be impacted because of the effort of our little church in Zellwood." Dave Gaedele also knows that feeling of a job well done. He shared his Saturday morning as a volunteer reporting to First UMC, Oviedo. "There are so many people that have a need. If I can give a short four hours of my life to help someone in need, it's the least I can do," he said. Above, Backyard Citrus Drive volunteer Dave Gaedele, followed by Bailey Hock and Miles Easton, talk about the rewards of helping others. Below, see a fun video of busy volunteers at First UMC, Oviedo, at the Society of St. Andrew's annual event. Videos by Don Youngs. The nonprofit Society of St. Andrew was founded about 34 years ago by two United Methodist ministers in Big Island, Va. Their inspiration for salvaging produce from fields was the biblical story of the loaves and fishes that Jesus miraculously used to feed the multitudes. St. Andrew recruits organizers and volunteers from churches, schools, homeless advocacy groups, nonprofits and corporations. The fresh produce harvested complements nonperishable foods, such as canned goods and cereals, at community food banks. In poor neighborhoods, residents without transportation often must shop at convenience stores rather than fully-stocked grocery stores, said Barbara Sayles, the society’s regional director. "Not only is it not affordable but when you're in a 'food desert,' you have no accessibility to fresh produce," Sayles said. "We're trying to fill that gap for food pantries." as many as 50 million people a year go hungry or worry about having enough to eat. People in poverty are more likely to be obese because cheaper foods tend to be high-calorie with little nutritional value. The fresh fruits and vegetables gathered by St. Andrew's volunteers and distributed at food banks "may be the only fresh produce they get all week," Sayles said. Pam Neal and her daughter, Abigail, members of River Run Christian Church in Chuluota, were among about 45 volunteers reporting Saturday to First UMC, Oviedo. It was their third time to volunteer for a St. Andrew's gleaning event. "We believe it takes a community," Pam Neal said. "It's never a bad thing to give back. We are blessed right here in Chuluota and Oviedo with what we have." Click here for information on programs and upcoming events of the Society of St. Andrew in Florida. Neal said she tries to instill that community spirit in her children. "Like they say, it is better to give than to receive," she said. "If your heart feels good, then you feel good." The team from First UMC fanned out to more than 10 locations to pick oranges, grapefruits and tangerines. Most of the sites were homesteads with one to four trees in the yard. Those and one commercial grove yielded about 10,000 pounds, said Ralph Betancourt, who has organized the church’s gleaning mission for five years. "It's a good time," Betancourt said. "I always enjoy the fellowship and meeting with different people." "It was more than enough to pick," Betancourt said. "There was still a lot of fruit on the trees." Volunteers are recruited at church and through radio advertisements. And some church members during the year keep an eye out for homes with citrus trees in the yard. "They'll jump out of the car and put a hanger on the door, just saying they noticed the citrus trees and please contact us," Betancourt said. Many people have trees that produce more fruit than they can eat. Betancourt said he has a single tree at his house that has produced more than nine bags of oranges in a season. "It's one of the things people don't think about," agreed Sayles. "You have one person with a tree, but if there are 400 other people with trees, that's 400 trees with fruit that would go to waste otherwise." -- Kathy Steele is a freelance writer based in the Tampa area.